The organ was built in 1842 (probably by the organs-builders Leymarie and Trouillet, Callinet's old pupils ). It was built into a black painted neoclassical case and included 7 stops.Thee of them was divided into basses and trebles which one keyboard of 54 keys and a coupled pedal of 13 Keys. Its renovation dates back to the 1950's when the Spiritual Concerts Assocciation decided to use it during musical events. First a pedal board was added in 1956, then so was a second keyboard in 1965. Nowadays, from the loft, the case with the central flat flanked with baroque volutes towers, wears a red and golden ornament. 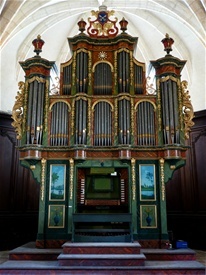 The instrument has been raised from 7 to 18 stops with Great and Choir organ and pedal. Francis Chapelet and the Association were in search of a concert organ for this church. They salvaged the organ from St. Matthew's Temple of Colmar which was stored on the gallery after a fire. The case, the Great's windchest, a few mechanical element and the front pipes were existing. This instrument has been built by the organ-builder Valentin Rinckenbach in 1842 (It had 23 stops at the outset). 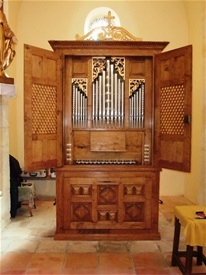 After his restoration, his reassembling and decoration in the choir, this case was equiped with a new instrumental part. The realization of which was G.Grenzing's work in 1980 and 1982. On both side of the console, Roger Chapelet, Francis's father and Official Painter of the French Navy, painted two pictures representing a pond of the Double on the left and the church of Ménestérol on the right. In 2002, Francis revived the case with decoration and a polychromy (painting in imitation of marble and gildings) and with the addition of a tiara at the top and two sculptured and foil gilt checks. In 2006, J.F. Dupont assisted some persons of the Association made a thorough cleaning of the organ as well an overhaul of the machanics. A "Dolzian 8'" filled the place of the small "Régale" of the Choir keybord. Coupler II/I - Pedal coupler I & II - Tremulant - A 440 - Equal temperament - North German esthetic. The pipes are principaly leaden. In 2008 Francis Chapelet who was passing through Didier Chanon's workshop at St Didier (Ain) caught right of two organs being built, one due to leave to a small village in Spain and the other one expecting an eventual purchasser. Francis decided to buy it in order to place it into the chapel of Montignac. This modest chapel from early 19th century is situated on a hillock in a campestral scenery and looks down upon the Isle valley. It contains a nice retable from 17th century with twisted columns (one of the most beautiful retables in Dordogne) which comes from the Vauclaire Carthusian Monastery. This new organ with single keyboard put in place in the tiny south transept, will be suitable for a continuo in baroque music consorts (or other one) as well as for a choir. Pedal - 8 notes - on Keyboard permanent pull-down pedal. A 440 - lightly unequal temperament. Two lattice doors cover the front. When opening them,we can see delicate embossed pipes which are surmonted by beautiful gilde sculptures. 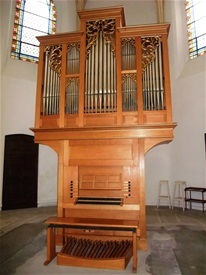 The 06 september 2012, an organ of the factory P. and M. VIER (Friesenheim in Germany) was erect in the beautiful gothic chapel of the ancient Carthusian Monastery of Vauclaire. 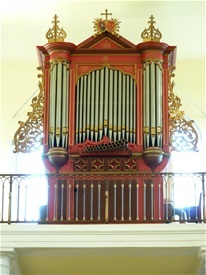 The organ was buit in 1983 by Peter VIER, for the cemetery chapel of Trossingen in Germany. As it was for sale, the association of spiritual concerts, after approval of the management of the hospital, went buyer, and the organ builder Martin VIER transfered it to Montpon (Vauclaire) after overhauling. The organ case is in solid oak and the organ has two manuals and pedal. The Mixtur can pulled in two time - 1' and then + 2/3 foot. - It is the same for the sesquialter, first the 2'2/3 and then the 1'3/5. Je découvre avec plaisir ce nouvel instrument !